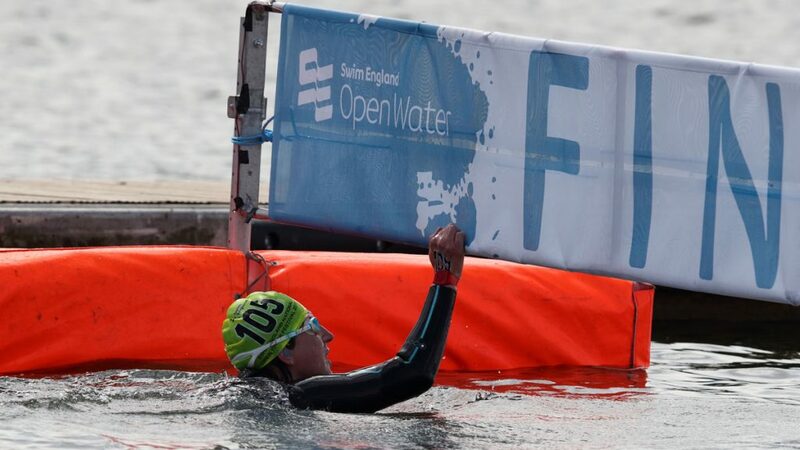 Strong winds forced the abandonment of the opening day of this year’s Swim England National Open Water Festival, which incorporates the Swim England Open Water Masters and Swim England Open Water Age Groups Championships as well as a 2km team event. The decision was made by the event’s Health & Safety Officer Alan Capstick after just one lap of the first wave of the 1.5k Masters’ race when conditions at Rother Valley Country Park caused canoeists to be blown over and the power craft to struggle against the waves. Winds reached up to 40mph throughout the day and with no guarantees that conditions would improve, the remaining Masters’ races were abandoned. Weather conditions, however, did settle overnight and enough for the scheduled Age Group Championships to take place the next day, although for Dorset’s competitors it was a very different experience to their qualifying swim at the South West Regional Championships earlier this month, which had taken place on a beautiful sunny day at Weymouth’s Preston Beach and with the sea like a millpond. Of the 28 qualifiers from the regional round, just 15 swimmers from three Dorset clubs made the trek to Sheffield but with no Dorset Masters having entered the competition this year. Neither was Dorset to be in the medals but, despite the difficult conditions and implementation of new and longer distances for each age group, there were seven top-ten placings and plenty of commendable times achieved. A medallist last year in the 1.5km event, Swim Bournemouth’s Alex Palotai-Avella finished top of the Dorset rankings with fourth place and time of 39.46 in the Girls 14 years 3km event just .02 sec behind her third placed rival, while in the Boys 15 years 3km, Poole’s Miles Ward finished fifth in 37.24 in a hard fought battle for the medals. Three sixth placings also came for Poole swimmers in the Boys 12 years 2km with Xavier West taking his first time in open water at national level in his stride to finish in 30.29, and Thea O’Keefe (17-18 years) and Kath Baker (19/over) who, having just completed six days at the British Summer Championships at Pond’s Forge, finished in 1:07.49 and 1:07.55 respectively in the Girls 5km event. The last top ten placings came from Seagulls swimmer James Richardson finishing seventh in the Boys 16 years 5km in 1:06.11, and Ryan Symington from Swim Bournemouth coming in ninth in 38.15 in the Boys 15 years 3km event. Alex, Miles, Xavier, Thea, Kath and James had all finished as champions in their respective age groups at the regional event on 7 July, bringing home the Swim England South West Region Open Water gold as well as a Dorset County ASA Open Water gold, with Ryan taking the South West and Dorset silvers. Swimmers competing at this year’s National Open Water Festival came from Dorset clubs as follows: Poole (Kath Baker, Finley Chandler, Jack Channon, Teagan-Mae Graham, Elizabeth Mills, Thea O’Keefe, Aimee Quarrie, Miles Ward, Xavier West, Jordan Young); Seagulls (James Richardson), Swim Bournemouth (Ryan Harper, Eve Hewett, Alex Palotai-Avella, Ryan Symington).